At the midpoint of meteorological winter (December-February), new high temperature records are outnumbering low temperature records in the U.S. by a ratio of 6.2 to 1, according to preliminary reports from the National Climatic Data Center. Thanks to an incredible ratio of nearly 34 to 1 in the first half of January, the seasonal ratio is the highest since the over 11 to 1 value last summer. 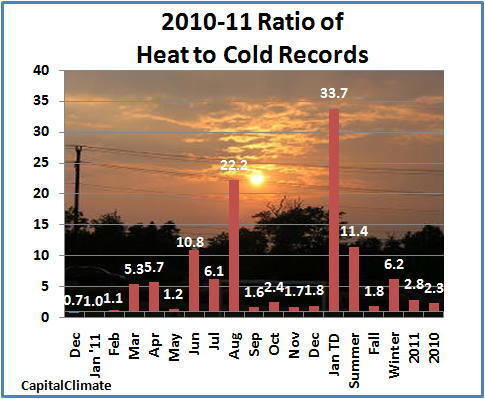 The total count of 2545 new heat records for the first 6 weeks for winter outnumbers the total cold records in the last 6 months of 2011. The preliminary analysis from NOAA/NCEP data for December 1-January 16 shows the warmest temperatures relative to average (as much as 8°C above) in western Canada, extending southeastward across most of the U.S. The only area in the country with substantially below-average temperatures includes New Mexico and southwestern Texas. 12:30 AM CST Update: It's semi-official; the preliminary daily climate summary for January 18 reports a low temperature of -1° at the Twin Cities. St. Cloud hit -9° tonight after having been -3° in the morning. The likelihood of witnessing a below zero temperature across southern Minnesota and west central Wisconsin during any given winter is very good indeed. There has NEVER been a winter where temperatures failed to drop below zero. In the Twin Cities, the long term average for the first below zero reading is December 9th. The least number of below zero days was 2, back in the winter of 2001-2002. January 18th is the latest date on record during the winter season that the Twin Cities has experienced its first below zero temperature (set back in 1889 and 2002). The temperature Wednesday morning (January 18th) failed to drop below zero, and is expected to remain above zero for the rest of the day, so this record has been tied. The "latest sub-zero temperature" record is expected to be broken tomorrow (January 19th) when temperatures drop below zero at the Minneapolis/St. Paul International Airport early Thursday morning. Mankato has also not dropped below zero this winter, as of January 17th. However, the low temperature is expected to drop below zero Thursday morning, ending the streak there as well. The least number of below zero days for a given winter in Mankato was 6 back in the winter of 1982-1983. St Cloud, Albert Lea and Eau Claire have already seen below zero days this winter. As of January 17th, St. Cloud and Albert Lea have all dropped below zero 3 times. Eau Claire has dropped below zero 2 times so far.